Signage helps promote the CLEAR biometric option at ballparks, where fans can register and be validated for the service in a couple minutes. Age verification to validate purchases of alcoholic beverages slows down concessions lines at sporting events, as many frustrated beer-loving fans know. But there may soon be a way to speed things up coming to a ballpark, arena or stadium near you. It already has to Safeco Field, home of Major League Baseball’s Seattle Mariners, followed shortly afterwards by CenturyLink Field, home of the NFL’s Seattle Seahawks and Major League Soccer’s Seattle Sounders. The system is based on biometrics and was developed by a company called CLEAR, which already has a similar system in place at airports to speed travelers through security lines. CLEAR biometric age validation and automatic payment makes concessions purchases quicker and easier. “What was interesting to both Safeco and CenturyLink was that we can speed up alcohol purchases as well as give customers a very seamless experience where there is a sense of freedom in not having to take a wallet out of your pocket and then take a card out,” explains Joe Trelin, CLEAR’s senior vice president of digital strategy, product management and new verticals. Basically, the CLEAR system uses the biometric facial or fingerprint image of an individual similar to how biometric systems in some schools and colleges are used to track school lunch sales or entry into dining halls, except that CLEAR is a nationwide network that enables a member to enroll once and then use the system at various touch points both in airports and other locations. It also must coordinate with the Transportation Security Administration at airports and state authorities to validate alcohol sales. Washington is the first state in the nation to allow the use of biometric technology to replace state-issued IDs for the purpose of purchasing alcohol, which is what led to the programs in the Seattle sporting venues becoming industry bellwethers. 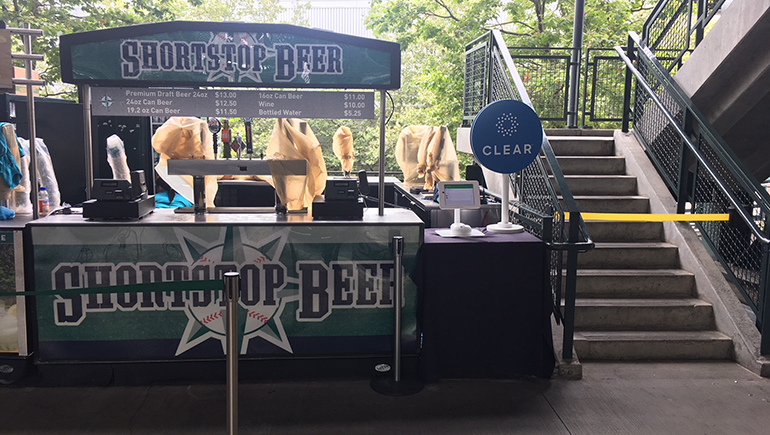 At Safeco Field, concessions operator Centerplate is working with CLEAR and debuted the system at the beginning of July. It is now in place at two concessions stands in the ballpark where CLEAR users have a dedicated lane to facilitate their transactions. The system not only validates age for beer purchases but links the customer’s credit card with the POS system for quick payment, a feature also available to customers under 21 making non-alcoholic purchases. A dedicated checkout line makes things even quicker for CLEAR users. Meanwhile, CLEAR’s debut at CenturyLink Field took place with a pre-season game between the Seahawks and Indianapolis Colts on August 9 and will be available going forward. 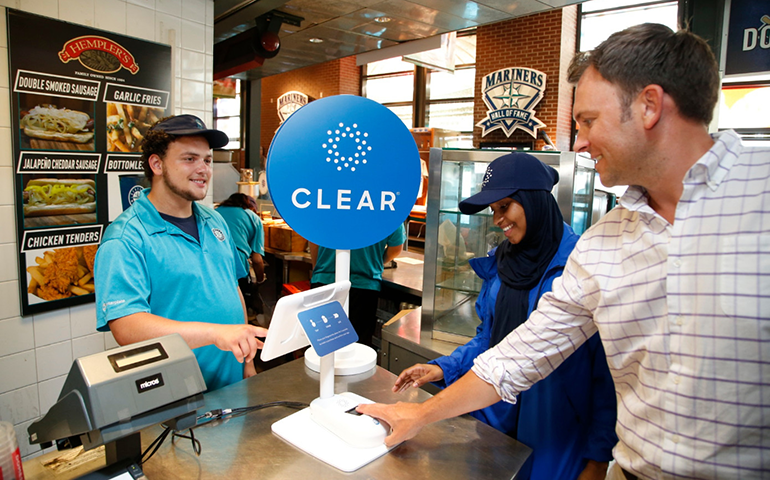 CLEAR also has inked a deal with Major League Baseball to become its official biometric identity and ticketing partner, which will allow seamless biometric ticketing at participating ballparks. The first team to participate, the New York Mets, is launching the service in September. “So now you can use your finger or face to get into the CLEAR express line and then just walk through [the gate] because they already know you have a ticket,” Trelin explains. “And then once you’re in the ballpark, you have to do nothing else to buy a beer using CLEAR. It also for the first time lets the team know who is in the ballpark—previously they only knew which ticket had been used but not who used it—which [facilitates] a natural loyalty program” because the team or concessionaire can compile data on a fan’s purchase habits. Trelin says the next stage in the technology will probably be a remote ordering version that would allow in-seat concessions purchases either through one’s own mobile device or a tablet wielded by a roving order taker that would register a customer’s face or fingerprint image with its built-in camera to trigger the transaction. Individuals can enroll in the CLEAR system at the sporting venues and airports where it’s available in a process that only takes a few minutes for age verification purposes and a bit longer for the more thorough airport security screening process. It involves the producing of a valid ID and the taking of a scan of the fingers and/or face. For airport screening, there are also a series of questions based on a person’s background data as an added layer of validation. The service is free when it comes to age verification and concessions and ticket sales, while its use in airports is a premium service that requires the payment of an annual membership fee. Trelin says sports and entertainment venues are a particularly attractive market for CLEAR because the crowds and long lines tend to cut into potential sales—up to 45 percent of beer sales don’t get made by one concessionaire’s estimate because of this discouragement factor. “We think the fact that we are adding an experience as opposed to being a pain will get people used to using CLEAR in high volume,” he predicts.